Check out our entire photo gallery from this game. BOWLING GREEN, Kent. – It’s getting easier each week to picture the Western Kentucky Hilltoppers going undefeated. 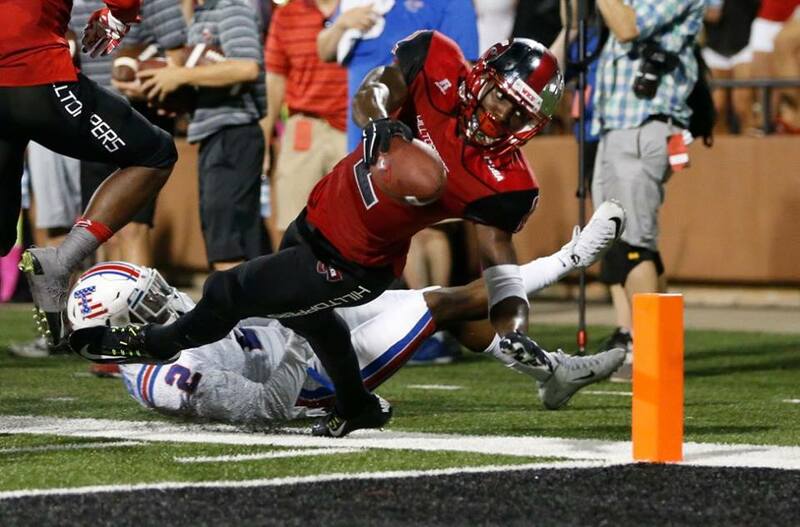 The Hilltoppers opened the season with two of their hardest games, but after a narrow 14-12 win in last week’s opener against Vanderbilt, the boys from Bowling Green held off a frantic LaTech finish for a second heart-stopping 41-38 win Thursday night. Brandon Doughty led the way for the Hilltoppers finishing 28-of-38 passing for 441 yards and a touchdown. Former Florida quarterback Jeff Driskel was solid for the Bulldogs finishing 28-of-48 for 357 yards and two scores while his backfield mate Kenneth Dixon carried the ball 22 times for 168 yards and two scores to continue climbing the NCAA’s all-time touchdown list. Dixon now has 56 scores – tied for 13th all-time – and he passed Tony Dorsett, Chester Taylor and DeAngelo Williams with his performance Thursday night. The College Football America 2015 Yearbook features 936 college football teams from the United States and Canada in 455 striking, full-color pages. That includes every team from the NCAA (FBS, FCS, Division II and Division III), NAIA, NJCAA and CCCAA, along with all 27 of the Canada Interuniversity Sport (CIS) programs. It also includes updates on club football, one-year postgraduate prep/sports academies and Mexican college football, along with dozens of action shots and stadium photos. The print edition is available online via Amazon.com and other major retailers such as Barnes & Noble and Books-A-Million. Additionally, the book is available in digital form at CFBMatrix.com.